The simplest performance enhancement; fit an H100A engine! 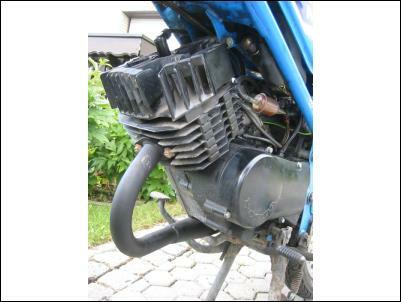 The engine needs to be from the Honda H100A commuter bike (along with the carburettor) and not the later H100S (it will fit but the cylinder head and barrel are different which require substantial modifications). If you carry out this modification you must; inform your insurance company of the change in capacity, inform the DVLA of the new engine number and that the bike is now a 99cc motorcycle (as opposed to a 30 mph restricted moped), re-stamp the plate on the frame as 99cc motorcycle and erase the 30 mph moped statement. By doing all of the above you should stay on the right side of the law! The H100A engine fits the MB5 chassis with very few modifications. I had to modify a sprocket from a Honda CG125 in order to gain the correct gearing. This was done by turning out the sprocket to fit the wheel hub and re-drilling the holes to suit (although I have since found that the rear sprocket from a MBX 80 fits straight on). The current gearing is 35 rear and 15 front which gives good acceleration and a top speed of about 65 mph (if you are 6ft 3" and weigh about 13 stone like me, you would not wish to go any faster on an MB!). 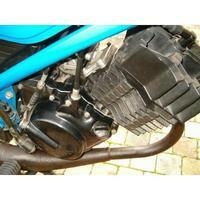 You will also need the exhaust of the H100A bike as well. A small bracket has to be fabricated for the exhaust bracket to mount to. This is because the bracket on the exhaust ends up further back than on the H100. Although the H100 exhaust was ok it did distract from the original look with it being chrome and a bit longer than the original. I was lucky enough to purchase a pattern MB8 exhaust which fits straight on without any modifications. It looks original as well which is a major plus point. Now you have got your MB5 going a bit quicker the next problem is the original speedo only goes up to 40 mph (on the old speedo I managed to get the needle pointing straight down!). I was lucky to purchase a new unit (hence the 500 miles showing) from ebay. It's from a H100S and as you can see it goes all the way to 75 mph. 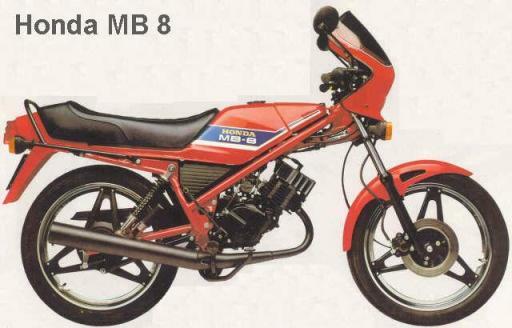 The larger engine does not look out of place (although it needs to be sprayed black to match the original) this is because the 80cc version (MB8) engine is physically the same size (outer dimensions). Overall the H100 conversion can give the appearance of a standard bike which does fool a few people into thinking it is original.